A Nose bleed is relatively common and cases can vary from a simple bleed of a few drops of blood to a frightening torrential hemorrhage. 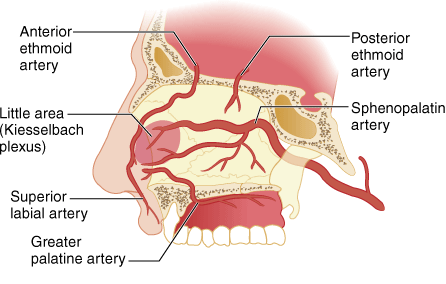 Bleeding is due to a rupture of blood vessels inside the nasal cavity either spontaneously or following trauma. Most bleeds (more than 90%) originate from the anterior part of the nose from the area called Little’s area in the nasal septum, in which most of the blood vessels are clustered together and is the most richly perfused area in nasal mucosa. Posterior bleeds are relatively rare and originate from the venous plexuses that drain blood from these areas, but they are often prolonged and difficult to control comparing to an anterior bleed. The material posted on this page for managing nose bleeds is for learning purposes only. To learn to recognize and manage nose bleeds and other injuries involving head trauma register for a first aid course today. Abuse and anticoagulants (aspirin, heparin, warfarin) which reduces the clotting ability of blood. Anatomical abnormalities of above mentioned blood vessels. Bleeding usually occurs from a single nostril, but if it is heavy enough blood can fill up the affected side of the nose and spill out through the other nostril as well. Blood dripping to throat and stomach will cause the person to spit or even vomit blood. If there is excessive loss of blood, patient will complain of dizziness, light headed-ness, intense thirst, shortness of breathing and faintness. Reassure the patient and calm him or her down. More than 90% of nosebleeds cause insignificant blood loss. Positioning is important. Let the patient sit upright and lean forward. Upright positioning will reduce the blood pressure in the head and neck region and this will reduce further bleeding. Leaning forward will prevent the swallowing of blood and prevent irritation in the stomach, which can lead to the vomiting of blood. Do not let him or her lie down or lean backward which can promote swallowing of blood. Apply direct pressure to the Little’s area (at tip of the nose) by pinching the soft part of nose – this promotes blood clotting and reduces the bleeding. You can use your thumb and index finger and apply continuous pressure over 5 to 15 minutes while breathing through the mouth. After 15 minutes remove the finger pressure and check the bleeding if still bleeding re-apply the finger pressure for another 10 minutes. If bleeding continues despite of above first aid measures, try to cool the area over the nasal bridge, which will cause the veins to shrink and reduce the bleeding. You can use either use a bag with crushed ice or a wet cold towel. If bleeding continues despite of all above measures contact your doctor. If a nose bleed occurs following a traumatic head injury it may be a sign of basal skull fracture and emergency medical services should be contacted immediately. Recurrent nose bleeding also is an indication to contact your doctor. Do not blow your nose because it can dislodge the blood clot formed and can lead to a re-bleeding. If you need to sneeze open your mouth so that the air will escape through mouth rather than nose. Inform the doctor if he is going to start drugs like Aspirin, Warfarin and clopidogrel.